As a child, your parent’s role was to care for you, teach you right from wrong, pass on good moral values, and be an example of unconditional love. However, as you grow older, you may have noticed a pattern of self-centered behavior in your parent’s life. All parents are different. While there are thousands of parenting books, no parent is perfect. And that is OK. But when a parent fills their children’s life with a toxic bitterness, jealousy, resentment, mockery, and the victim mentality, they make it impossible for their child to have a loving and natural parent/child relationship. Let me preface this article by saying that I believe strongly in the concept of honoring your parents. Their role is incredibly important. Parents can be an invaluable source of love, support, and family unity. In return, you are able to love, support, and care for your parents. It’s the natural circle of life! However, if they are “toxic”, this role can turn into a source of heartache and pain in your life. 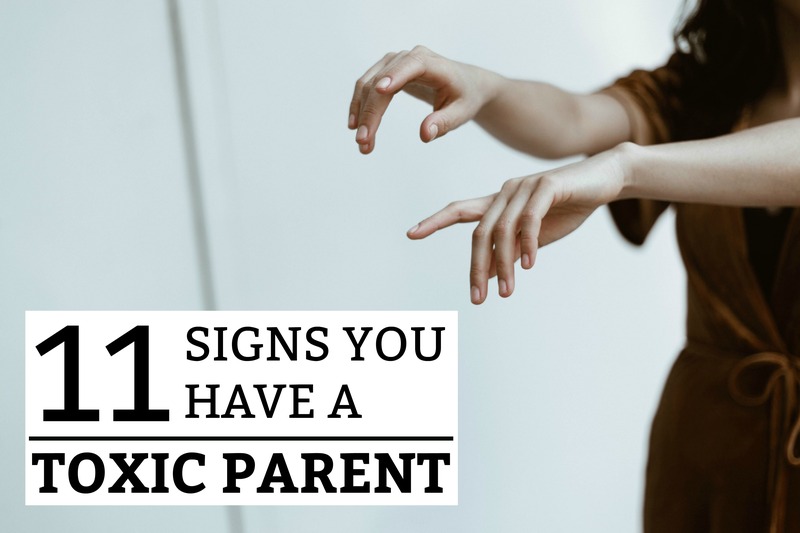 Below are 11 signs you have a toxic parent. No, this is not referring to a parent taking the ‘tough love’ approach. Simply put, everything has to be about them! Their conversation is full of the words “I”, “my”, and “me”! When you talk about yourself, do you ever notice them becoming impatient or restless? Perhaps you’ve had to learn that you can’t talk to them about something you are struggling with or something you have achieved – because somehow, they will ALWAYS turn the conversation back to themselves. This is a touchy subject! Because it is completely natural for a parent to want to feel needed. However, this feeling can become toxic when they actively don’t allow their child to grow up. They undermine your decisions, invade your privacy, insist on knowing about the private parts of your life, or even get upset if you make a decision different from their own. They senselessly demand the same level of control that they had when you were a child. And when you show signs of independent thinking or distancing yourself from their toxicity, they become incredibly offended and resentful. If they want something from you or want you to do something their way, they always use a manipulative tactic. If you disagree with them, they will turn the situation around on you and make you feel remorseful for something that was never your fault in the first place! They will even use kindness and gifts to manipulate you. Insisting on paying for your phone bill, so they have access to your phone records. Telling you that you are in their will, but subtly letting you know that there are strings attached. Giving you ultimatums if you don’t do as they ask. Sending you guilt-ridden messages to make you feel inadequate. Their goal is to do whatever it takes to get their own way. But they are short-sighted, and don’t foresee the incredible damage this will do to your relationship. Do they ask invasive questions or overstep clearly stated boundaries? When you sit down and try to talk with them about healthy boundaries, do they get upset and make you feel guilty for even asking in the first place? Basically they want full access to your life – no questions asked. Don’t let them manipulate you into letting them walk all over your boundaries. No amount of anger, guilt-tripping, confusion, tears, or blame-shifting should ever force you to give in to their toxic demands. What they need is consistency. They need to see that you are consistently firm with your clearly-stated, healthy boundaries. When you don’t do things exactly how they like, they use their status as your “Mother” or “Father” against you. A parent that will use their status as a guilt-tripping tactic needs to realize this is an inadequate way to maintain a healthy relationship. Their role as your parent shouldn’t have to be used for manipulation purposes. From a young age, do you remember your parents saying subtle things to you about taking care of them when they are older? No, I’m not talking about the natural and loving course of life – where you lovingly take care of your elderly parents when they are older. I’m talking about a parent conditioning a child to feel the intense burden of supporting them during retirement. They never think about how they can help you. They act like they brought you into the world for one reason – to fulfill their selfish retirement plans. When you don’t do what they want, their “anxiety and depression” get worse. Once again, they have come up with another brilliant plan to guilt-trip you into doing what they want. They will blame you for being so negative, selfish, and unsupportive that you are effecting their mental health! This tactic is designed to make you feel guilty and sympathetic enough to do what they want – for the sake of their health. Something amazing has happened in your life! And you can’t wait to tell your parent(s) about it. But they don’t seem happy for you. And if they do seem happy, they soon ruin the moment by asking an invasive question. Sometimes, you wonder if they have truly ever been proud of you – simply because you were their child and they love you. Everything feels like a jealous competition with them. If you dare to confront their toxic behavior, they will always point fingers and shift responsibility onto someone else. They will act incredibly insulted and may project anger and rage! Immediately, they will victimize themselves, pointing out how you are ganging up on them. Perhaps they will blame their actions on a recent life event or a health problem. Blame can never be put on them! They act like you are an extension of them. All your accomplishments are because of them. They can never let you have the spotlight without jumping in it themselves and attempting to take it off of you. They are skilled at making everything about themselves – including the greatest successes of your life. Their self-obsession knows no boundaries. If they aren’t the center of attention, they believe that they are not receiving the recognition that they DESERVE. They will either sulk in a corner, take responsibility for the accomplishment, or leave in a cloud of envy. Has your husband or wife ever been disrespected by your parent(s)? This is absolutely wrong and should not be tolerated. Your loyalties to your spouse should always come before your parents. It is your job to protect the dignity, honor, and reputation of your spouse. If you are allowing your spouse to be disrespected and mistreated by your parent(s), this will cause a division within your relationship that may eventually end in separation or divorce. If they cannot be kind and cordial to your partner, then you need to address it. From a young age, you learned that you couldn’t trust your parents. If you told them a secret, they couldn’t keep it. They would use personal information about you for their own benefit – often embarrassing you. They are all about #1 – themselves. Whatever it takes, even if it is at your expense. Parents play an amazing and crucial role in society. Most people grow up and become parents – and realize just how difficult the role is. However, many allow their love to grow toxic and manipulative. As a result, they lose the one thing they may want the most – a relationship with their child and their family. Controlling behavior can wreak havoc on the family unit. Always communicate your concerns with your parents and see if you can loveingly work through your differences. However, if their toxic behavior continues, you may have to take the steps to distance yourself from them and their toxicity. I am a parent of 3 grown children. I feel my daughter is toxic to me with the list of signs above..